The first botanical illustrations of the saguaro, or Cereus giganteus as named by George Engelmann in 1848, were drawn by Paulus Roetter for Engelmann’s “Cactaceae of the Boundary”, part of the U.S.–Mexican Boundary Survey Report (1859). With no living plant to use for reference, Roetter worked solely from specimens of spines, dried flowers, and fruit preserved in alcohol. These had been collected in Arizona by George Thurber in 1851 and sent to Engelmann in St. Louis for his work in describing the cacti of the borderlands. To depict the habit, or growth form, of the saguaro, Roetter relied on field sketches from the survey party’s artist, Heinrich Balduin Möllhausen. Without ever having seen the gigantic saguaro in its natural setting, Roetter nonetheless created a magnificent interpretation of the plant that Engelmann chose as the frontispiece for his report. 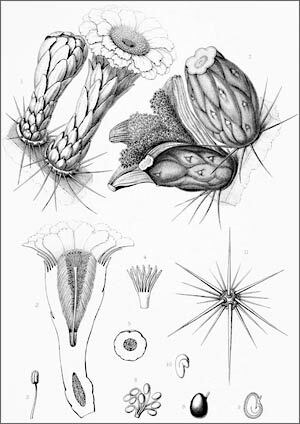 While Roetter’s illustrations for the Boundary Survey are strikingly beautiful, they did not constitute a complete botanical illustration of the cactus. 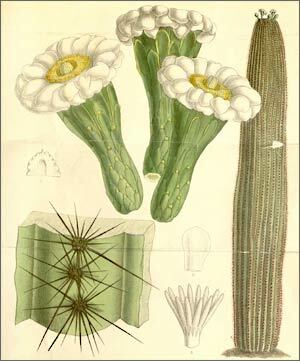 In 1892, Curtis’s Botanical Magazine published Matilda Smith’s color illustration of the saguaro with the flowers, spines, and habit, all drawn from a live specimen growing at Kew Gardens in England. The following year, a more complete botanical plate by Charles Edward Faxon was published in Vol. 5 of Silva of North America . His illustration portrayed the flower, fruit, and seed alongside a floral cross section and enlargements of all the flower components. Faxon notes that his drawing was prepared from the top of a severed stem that had been sent to him in Massachusetts from Phoenix. He placed the stem on a board in his greenhouse, and the small buds on the stem flowered and produced fruit, enabling him to depict the complete flowering cycle. This appeared in the June 2013 issue of The Desert Breeze , the monthly newsletter of the Tucson Cactus and Succulent Society.